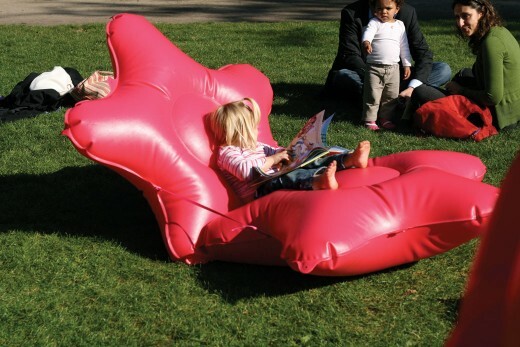 We've all heard of "Bring Your Own Beverage," but what about "Bring Your Own Playground?" 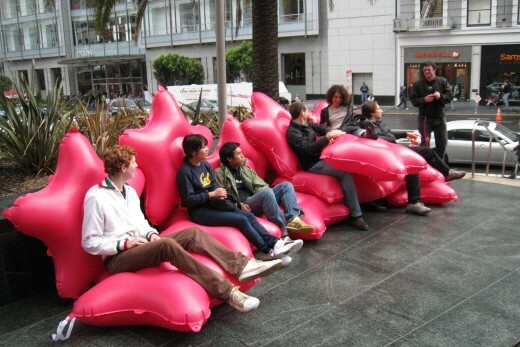 With the Bushwaffle, a "personal space softening device" (PSSD), pioneered by the design studio Rebar, citizens can furnish plazas, parks, and other public spaces with inflatable cushions that serve as chairs, building blocks, or mini-trampolines. "Bushwaffle invite new forms of social interaction, collaboration, improvisation, and play... Bushwaffle are also entirely kid-friendly, their bright color and playful shape encourage cooperation and play among friends and new acquaintances... Bushwaffle float, slide, roll and bounce, and are easily moved by a large enough crowd, even when in formation." Images courtesy of Rebar. 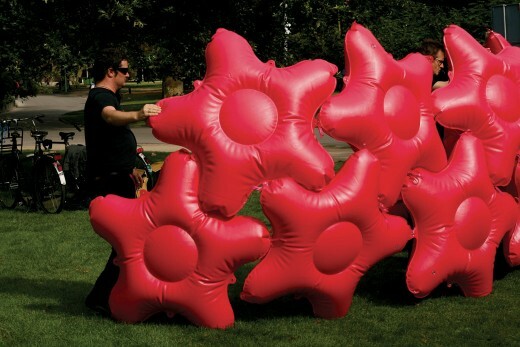 See other playful innovations from Rebar. Play is a mindset. It shouldn't be restricted to the playground; neither should it be restricted to children. 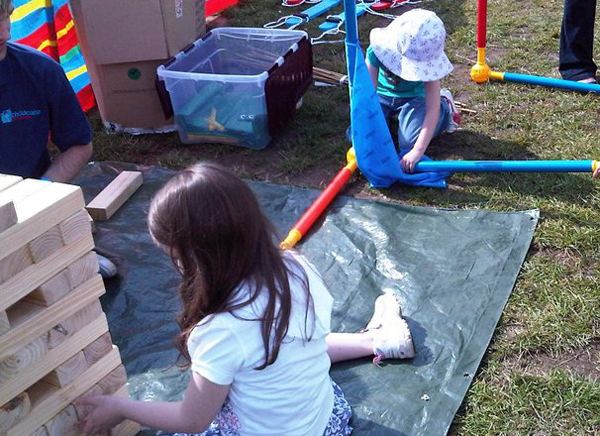 Play is for everyone and can happen everywhere! This was the philosophy that drove our recent work at last week's re: Streets charrette, which brought together urban planners, landscape architects, environmentalists, city officials, and play advocates from across the country to "explore the future of streets and what America's roadways would be like if they were designed for living, instead of driving." One of our challenges as part of the "Play and Recreation" working group was to redesign a residential street to offer play opportunities to neighbors aged 0 to 100. 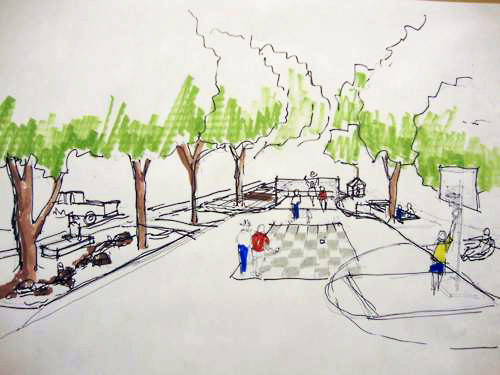 We all agreed that it was important to design the street so that cars and playing families could co-exist, but that it was also important for the street to close periodically so that neighbors could gather and play without the interference of cars. 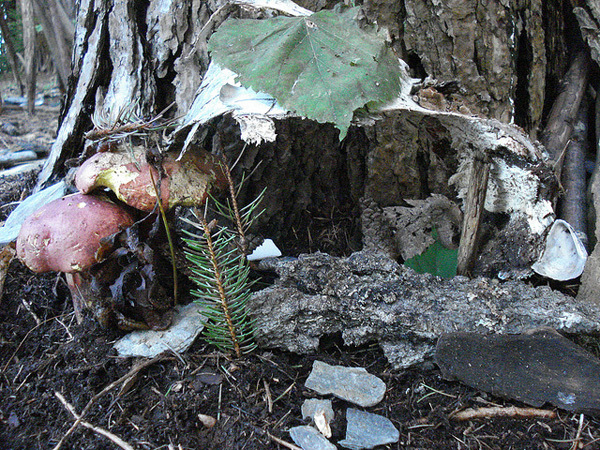 Trees for shade and nature play. Paint! 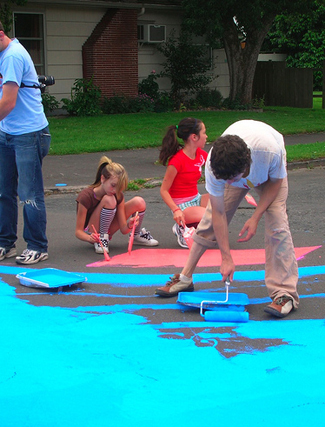 Paint is cheap and can not only beautify a street but can also be used to create basketball courts, four-square, and other games that encourage physical activity and intergenerational play. Seating and storage. Creating spaces to gather and socialize is essential. We discussed benches that offer storage space to store balls, art supplies, and loose parts for pop-up playgrounds. Game equipment like basketball hoops, outdoor ping pong tables, and hockey nets. Traffic calming measures like sidewalk extensions that can also house planters and benches, bollards to place at each end of the street during closure (can they double as drums? ), and signage to slow cars. Vertical elements -- why not put handholds on fences, walls, and tree guards to encourage climbing, or let fences double as outdoor chalkboards for public art? Sand and water play. A spigot or sprinkler? A sidewalk sandbox? 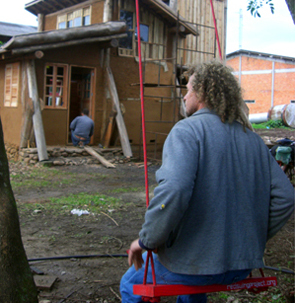 Most of these ideas are things that neighbors can build, create, or install themselves. We also discussed creating a "Play Street Kit," complete with game stencils; DIY instructions for building sandboxes and storage benches; and other play elements. What would you like to see included in this kit? 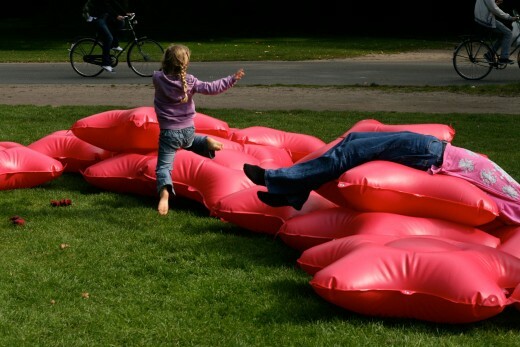 What other ideas do you have for making your street more playful? Don't feel like driving your kids to summer camp? Start your own camp, then—on your own street. That's exactly what neighbors Jennifer Antonow and Diana Nemet decided to do last summer, and they insist that getting a neighborhood camp up and running is not nearly as daunting as it may sound. Inspired by Playborhood founder Mike Lanza's Camp Yale, Jennifer and Diana kicked off Camp Iris Way in Palo Alto, Calif. last summer and returned this summer for a second round. This year's session, in early June, attracted a whopping 72 children and teens—more than 90 percent of the youth in their neighborhood! Whether via an email listserv, a community meeting, or door-to-door visits, determine who wants to get their kids involved and who wants to help you organize the camp. You're likely to get a positive response—all parents are looking for something for their kids to do during the summer, and the closer to home, the better. Gather a preliminary list of children's names and set up a planning committee. All neighborhoods are different. Do you live in a housing development with a communal space? Do the houses in your street have front yards? Backyards? None of the above? Jennifer and Diana were actually successful in petitioning the city to close their street between 8:30 a.m. and noon each day (see this report from Transportation Alternatives for more guidance on closing your street for play). Whatever the set-up, they recommend rotating the camp to be in front of (or behind) different houses each day—that way, the campers become familiar with one another's houses and may feel more comfortable paying a visit after the camp is over. Summer is a time of notorious restlessness and boredom for teens. A neighborhood camp gives them something to do and helps connect them to their immediate community. Jennifer and Diana want their teen counselors to take ownership of camp activities, and even put them in charge of “counselors in training”—fifth and sixth graders who will assume counselor roles in the coming years. The camp fee—$110 per week—helps to cover the teen counselors' hourly wages. Jennifer and Diana actively involve the teen counselors in planning each day's activities, which they keep track of in a simple Google doc. Their largest fear starting out was that they didn't have enough for the kids to do, but it didn't take long to realize, “Hey, kids can entertain themselves!" Jennifer points out, "Kids' lives are really structured these days," and in creating their camp schedule, they purposefully keep the agenda light and flexible. Each morning consists of a warm-up, an art project, a team activity, and a large-group activity, but some of their favorite activities have emerged organically from free play—like a spontaneous hula hoop train. 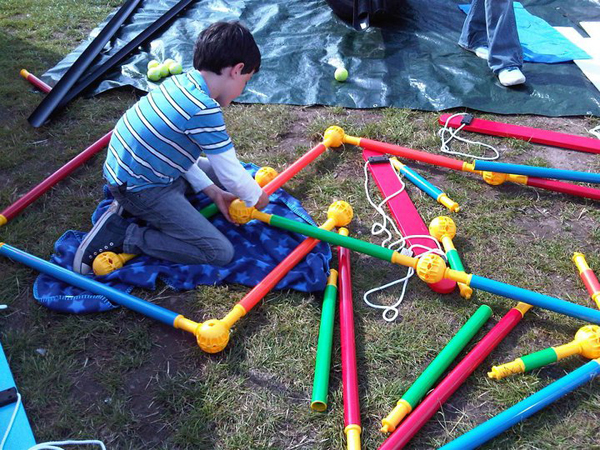 There's no need to drop hundreds of dollars on camp materials—instead, call on your neighbors to donate play equipment and art supplies. You'll likely be amazed by how much you have to draw from when you pool your resources. If you still fall short, see if your town has a local scrap store (like this one in San Francisco) where tons of recycled and reused materials can be bought for cheap. A neighborhood camp also offers a wonderful opportunity for businesses to give back to the community. Jennifer and Diana partnered with Klutz, an activity book company, which donated art supplies. You can also scout out delis or corner markets, which may be willing to donate snacks or lunch. 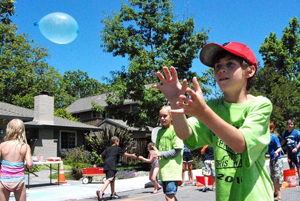 Don't forget the most important part of a neighborhood summer camp—play! And what's even better, the play continues all year long. Jennifer and Diana say their inaugural camp last year has had a lasting ripple effect on the community. Because everyone contributes to the camp in some form or fashion, everyone feels both connected and invested. Even after the last session drew to a close, neighbors were ringing doorbells, borrowing eggs, and hanging out on the street to socialize. There you have it—six steps to getting kids outside, empowering local teens, pooling community assets, and in the process, transforming your neighborhood. Don't just shake your head and lament that your neighborhood has no camp of its own—get out there and start one! Photo credit: Aaron Selverston, Palo Alto Patch. 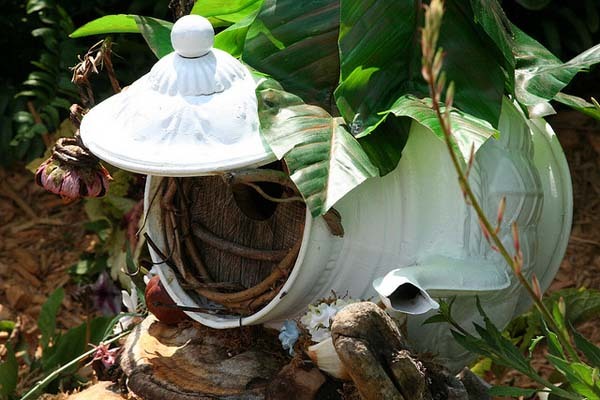 Is your community drab? Sterile? Unwelcoming? City Repair to the rescue! In our last "Bright ideas" post, we showcased Detroit's Mower Gang, a group of citizen activists who have taken it upon themselves to help maintain Detroit's parks. 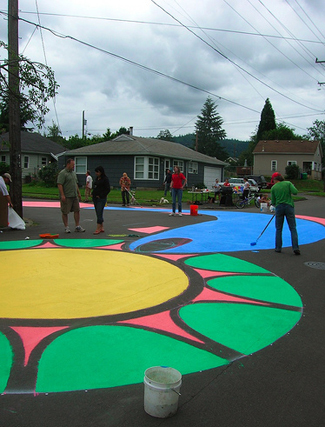 Here's another inspiring example of citizen activism in Portland, Ore., where a volunteer-driven nonprofit group called City Repair motivates residents to take ownership of their communities by infusing them with play, color, and public art. Among many projects, City Repair just wrapped up its yearly Village Building Convergence, an "annual ten-day placemaking festival that combines crowdsourced activism, creative community development, hands-on education and celebration." 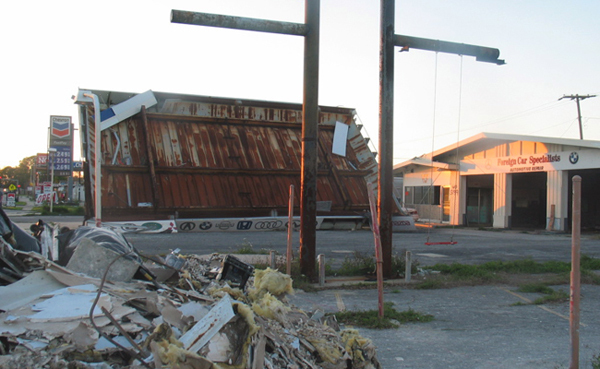 Check out City Repair's other projects and get inspired to bring some life to your city. Photos courtesy of City Repair (cc). 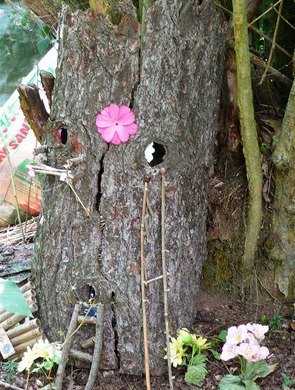 An ill-maintained park becomes vulnerable to vandalism and crime. A playground covered in graffiti invites more graffiti; a field scattered with trash invites more trash. A single park closure can launch a vicious cycle that changes the entire character of a neighborhood. It can also lower property values and deter tourists. Their work doesn’t stop at mowing, either. 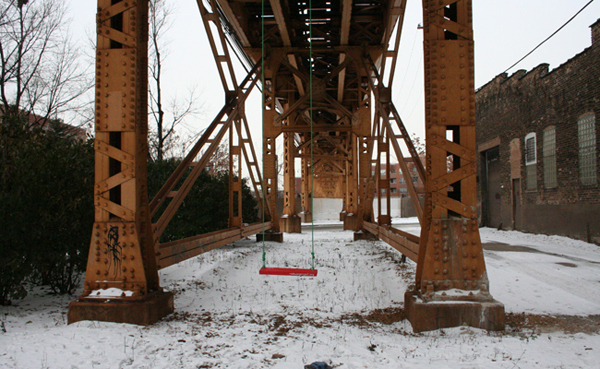 Realizing that many playgrounds in Detroit had swing sets, but no swings, the Mower Gang began a project on Kickstarter to replace 40 of the city’s 200+ missing swings. They aimed to raise a modest $800 and ended up with $3,020. 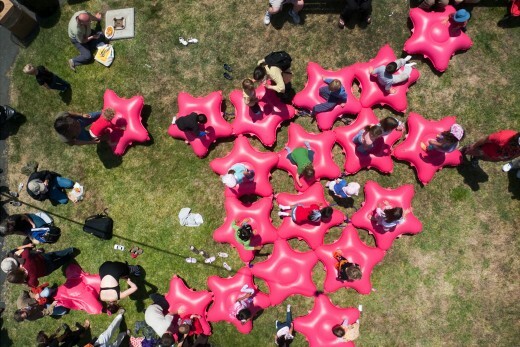 And yesterday, on May 15, the Mower Gang convened to create the “largest community watermelon park” in the city. Why? Because watermelon is “delicious, nutritious, and easy to grow.” Do you need a better reason than that? At Riverside Park, the Mower Gang not only trimmed the lawn but took advantage of gang member's expertise in cement work to help repair this play structure. 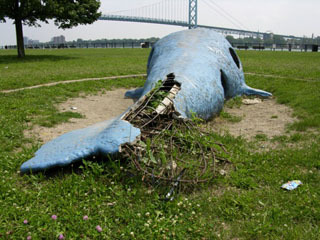 After a paint job, the whale looked as good as new. 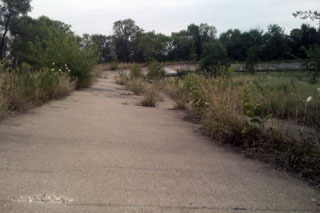 Photos courtesy of MowerGang.com. The gang got creative with their mowing here. Why mow an entire field when you can mow a human maze? Photos courtesy of MowerGang.com. 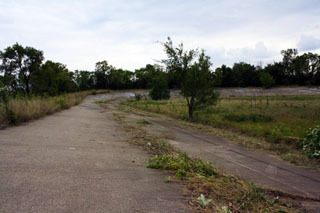 These before and after pictures of an abandoned racetrack show the effects of a little TLC. Photos courtesy of MowerGang.com. It’s amazing what you can accomplish with a playful spirit, a can-do attitude, and a lawn mower. There's one surefire way to beautify your local playground: just add green. 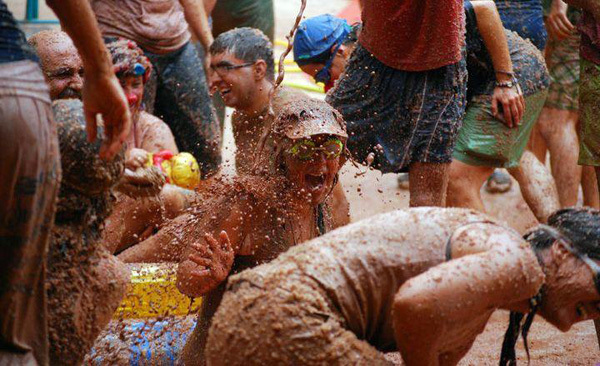 But put away your shovels and gardening gloves; get ready to fling some mud! The "Batalla Verde," or "Green Battle," was originally staged by the Spanish design firm Urbanolismo in the town of Castell de Guadalest. Seeking an efficient, entertaining, and community-oriented way to plant its newly designed Mora Park Playground, the firm set 200 volunteers loose on huge containers full of seeds, clay, dirt, and water. The result? 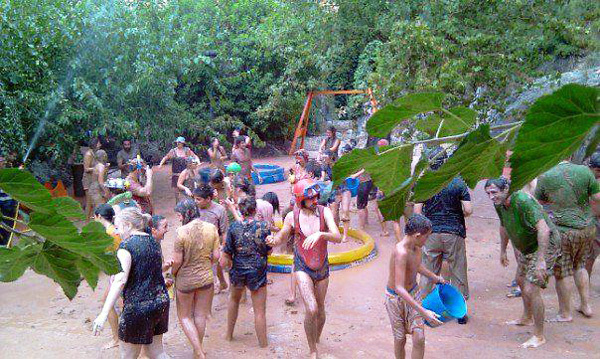 A massive mud fight that gave rise to a garden a few weeks later. 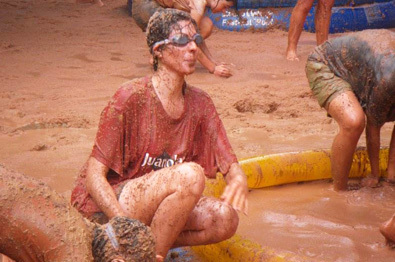 Has volunteering ever looked so FUN?! See more photos on Urbanolismo. The firm is seeking a site for its next Green Battle. Any takers? Special thanks to Playscapes for sharing this wonderful initiative! All children need access to a playground, but that doesn't mean play has to be confined to swings and slides. Play, by its very nature, is spontaneous -- it can happen nearly anywhere, with nearly anything, and under nearly any circumstances. After World War II, Danish landscape architect Theodore Sorensen observed children's delight over playing with rubble and scraps, an observation that led to the birth of Adventure Playgrounds. 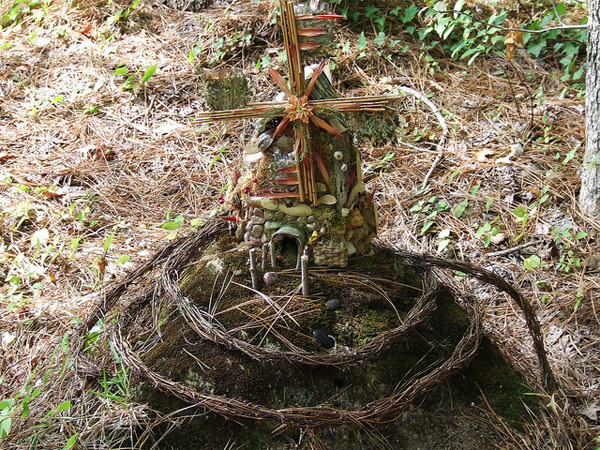 We have covered some notable Adventure Playgrounds previously in this blog. While Europe boasts over a thousand, our risk-adverse society can only stomach four. 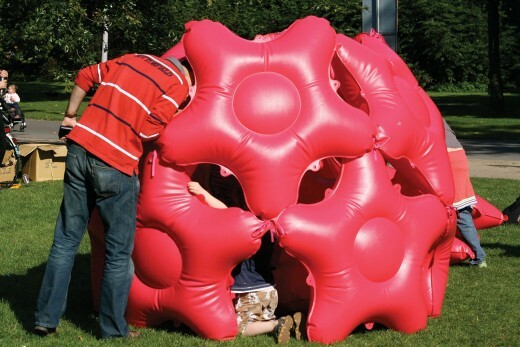 However, a new kind of Adventure Playground has begun popping up, literally. 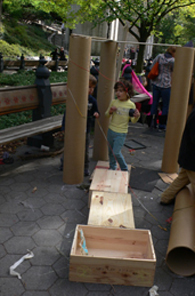 In New York City, a team of play and child professionals, designers, artists and filmmakers are pioneering Pop-Up Adventure Playgrounds, in which children create their own worlds out of everyday items that are not normally considered "toys." 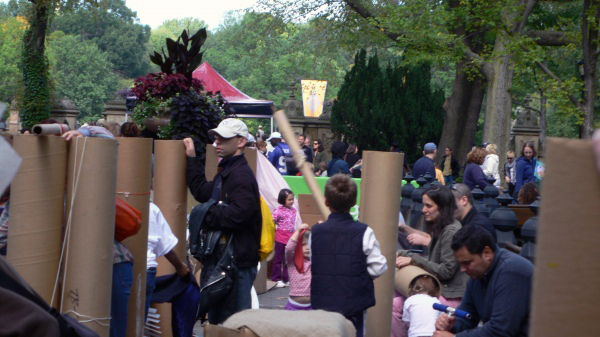 Just as play can erupt spontaneously, a Pop-Up Adventure Playground can pop up anywhere -- in a park, a front yard, a plaza, on a sidewalk... the possibilities are endless. 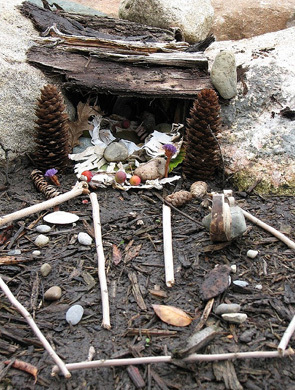 The idea is simply to get kids playing outside with other kids, in an environment that flexes their creative muscles. The best part? 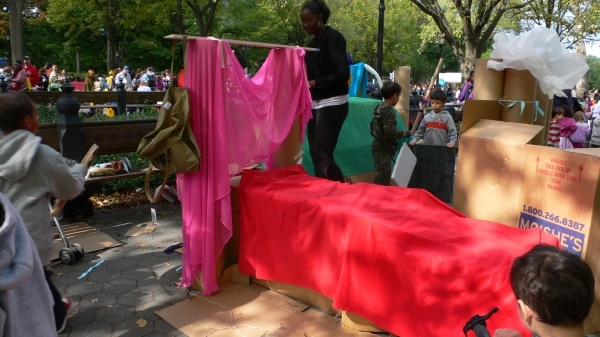 A Pop-Up Adventure Playground doesn't have to cost a dime. While it may be difficult for adults to envision the play opportunities presented by, say, a stack of newspapers, children will inevitably turn them into hats, or curtains, or faux snowballs. Photos taken during the Ultimate Block Party, courtesy of popupadventureplay.org. To learn more, visit popupadventureplay.org. 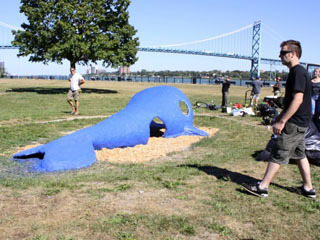 And don't miss their free upcoming webinar this Thursday, Feb. 17, Intro Series on Pop-Up Adventure Playgrounds. We've all built sandcastles and snowmen. 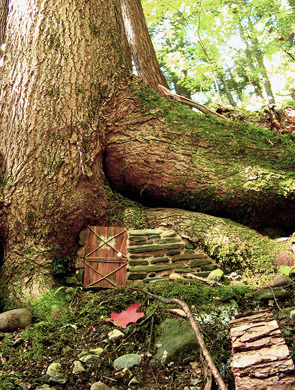 But have you ever built a Fairy House? 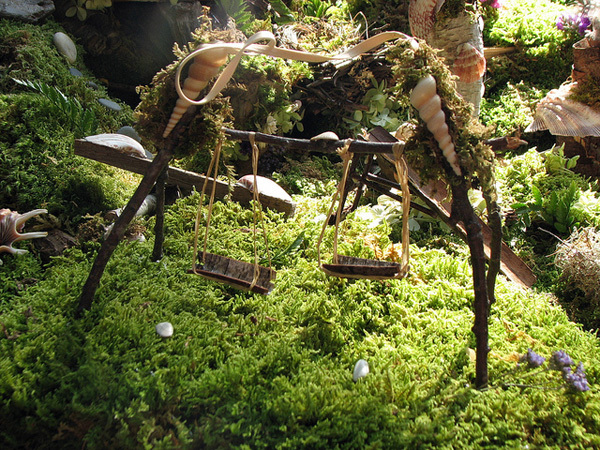 These whimsical "bonsai houses," which are the perfect size for fairies and other small creatures, are constructed of natural materials, like sticks, bark, dry grasses, pebbles, shells, feathers, seaweed, and pine cones. 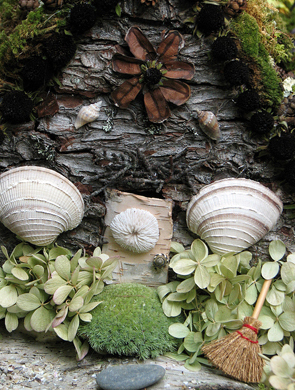 Fairy Houses originated on islands off the coast of New England and have since been popularized by Tracy Kane, author and illustrator of The Fairy Houses Series®, who promotes building them as a way for adults and children to use their imaginations and connect with the natural world. 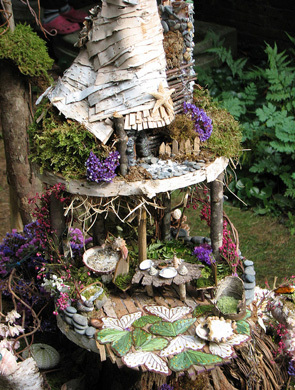 You don't need a forest to build a Fairy House -- you can build one in your yard, at your local park, or in a tree on your street. 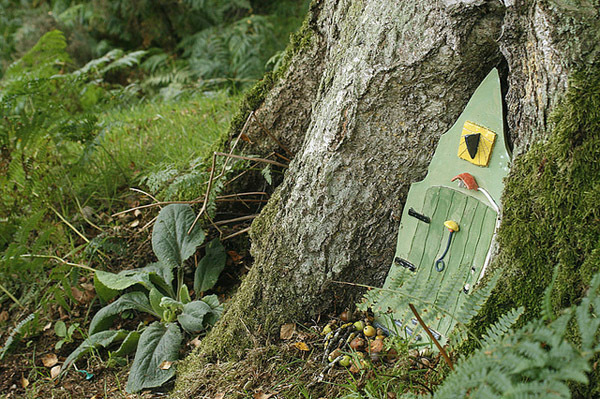 Sprinkling Fairy Houses throughout your neighborhood is a surefire way to bring wonder and delight to unsuspecting passersby. photo by Urban Sea Star (cc). photo by Kathie Hodge (cc). Left photo by Canton Public Library (cc). Right photo by Ella Larose (cc). Photo by Jeff Christiansen (cc). Photos by Ella Larose (cc). Photo by Amy Bradstreet (cc). Photo by Alan Cleaver (cc). 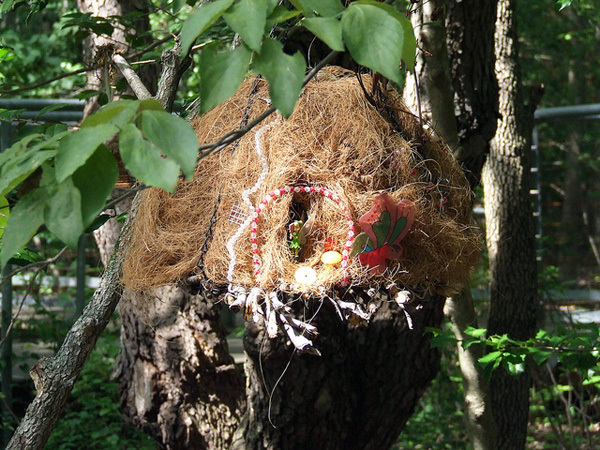 Learn more about Fairy Houses and access instructions for building one at FairyHouses.com. Playgrounds for delivery? 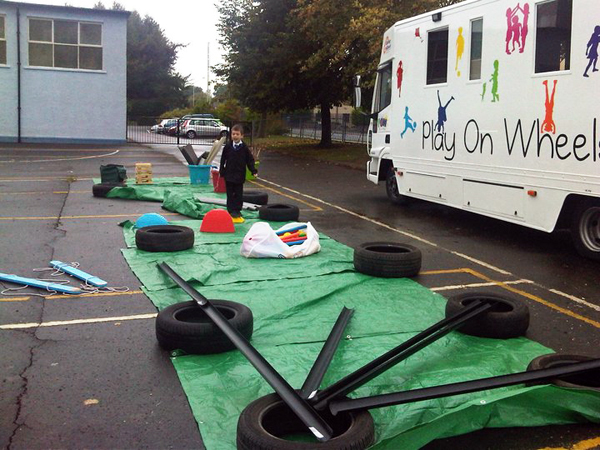 In Dundee City, UK playgrounds Play on Wheels (POW), a “mobile play service,” delivers temporary playgrounds to children in need. 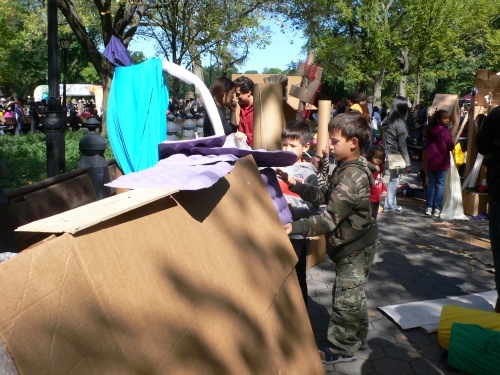 Filled with crafts, loose parts, and other “play stuff,” the POW vehicle travels to schools, parks, and public spaces, offering children opportunities for unstructured, child-directed play. For decades, mobile ice cream shops (aka "ice cream trucks") have brought the joy of frozen creamy goodness to children everywhere. Who is to say that trucks can’t bring children playgrounds, too? Photos courtesy of POW. See more photos. Intrigued? Working on Wheels encourages you to consider setting up your own Mobile Project, and offers an online guide to get you started. Learn more about POW and the National Association of Toy and Leisure Libraries.